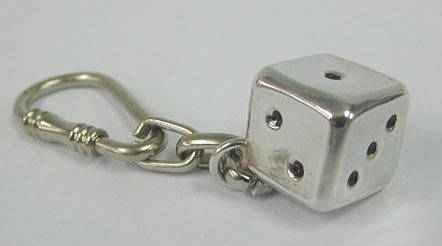 Great Artisan Sterling Silver Dice Key Chain A great artisan sterling silver dice key chain. This key chain was made in the electroforming method. A magnificent sterling silver key chain which will be a great gift to any friend and to any occasion. Measurements : Marks : Length: 3.8in. / 9.65cm. 1 inch = 2.54cm 925 for sterling silver. Weight : 24.2gr. / 0.77oz.